Showbina is coming to the lesson with the aid of a walking stick. 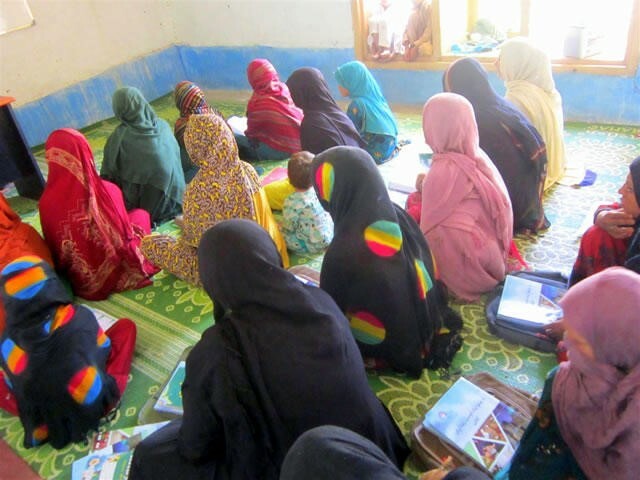 JVC started literacy lessons in several villages in Afghanistan this summer. The lessons are for people who either could not make the long commute to school, or for those who could not attend school in their younger days due to some issues. The lessons offer the opportunity to learn reading and writing skills again. Our local female staff, Karima, interviewed one of the students there. 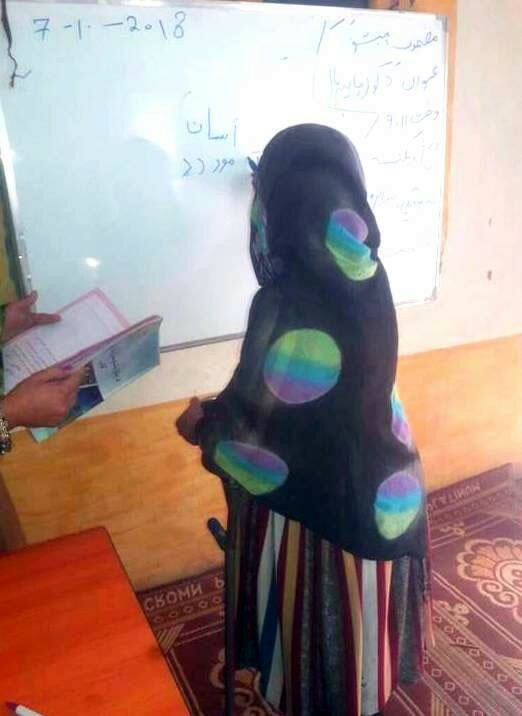 Showbina is a 25-year-old woman who is taking literacy lessons of Ms. Sayra in the Kachara village. She is from an economically unstable family. Her father is a farmer and her mother is a housewife. She has 10 brothers and sisters. Six of them are married and live separately. One of her younger brothers graduated from high school and currently works at a shop. When she was 3 months old, her family evacuated from Afghanistan during the civil war and moved to Pakistan as refugees. In Pakistan, she was suffering from an illness that caused her legs to constantly become skinnier, making it difficult to walk. After moving back to Afghanistan, she had surgery. However, her legs never recovered fully so she needs to rely on a walking stick given by the hospital. Since then she uses the stick everyday. She even feels pain in her legs on cold days. Participants wear colorful costumes. Children are watching the lesson outside the window. If Showbina really becomes a teacher and helps the students nurture their dreams in the future, then there is nothing more pleasant than that. Education is an investment towards the future. JVC will make such a place where learning supports the continuation and expansion of education in the future. ← Vote for children in South Sudan to help them go to school !